DisplayPort is one of the newest video interface standards introduced by the VESA. Typically, DisplayPort is not directly compatible with DVI or HDMI; however, the 483 series includes dual-mode capabilities that allows the transmission of a single link DVI or HDMI source across the interface through the use of a 3rd party external passive adapter when used point-to-point. 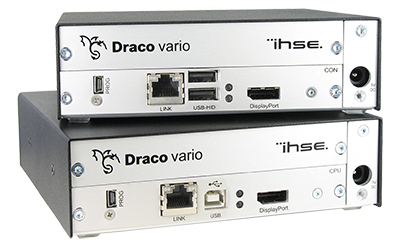 When the 483 series are used as part of IHSE USA’s unique matrix switch systems, it becomes simple to connect HDMI/DVI displays to DisplayPort sources or vise-versa. The Series 483 units can transmit video and audio simultaneously with embedded audio as part of the DisplayPort 1.1 standard. They support most digital audio standards enabling playback of the audio signal through monitors with integrated loudspeakers. However, a unique feature of the 483 series is the ability to embed digital audio from a secondary source when a 474 series audio/data expansion card is added to the main DisplayPort unit. There are a number of option cards available for additional signal transmission alongside DisplayPort, such as USB 2.0, Digital Audio, Analog Audio, RS-232 and RS-422. Two RJ-45 (copper Cat-X) or duplex LC (singlemode or multimode fiber) connections allow parallel path transmission that can be connected in variations of backup, redundant, or parallel path configurations. IHSE USA’s 483 series can be used in very large facilities for operation areas such as command and control, airport kiosks, presentation walls, surveillance rooms, mobile production operator stations and other connections requiring long distances KVM transmission between facilities such as university campuses. DisplayPort transmission over IHSE USA’s fiber units is inherently secure and immune to EMI making it a favorable solution for government, military, air traffic control towers and medical environments. Support for DisplayPort 1.1, USB-HID, embedded USB, Audio, and RS-232. Supports computer video to 4096 x 2160@30Hz and lower resolutions up to 2560×2048@60Hz, including 1080p60.